Then, unexpectedly, in January, 1960, at age thirty-one, he gathered together as many of his works as he could find and burned them. 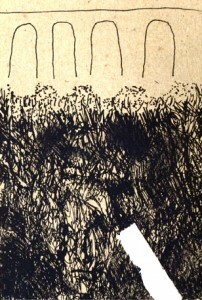 At noon, four days later, he had a pleasant cup of coffee with Frank O’Hara and Todd Heuber. At five o’clock that afternoon, midway between the Statue of Liberty and the Jersey shore, he jumped off the back of the Staten Island Ferry and committed suicide. Hart Crane, too, had jumped off a ship in the Gulf of Mexico at age thirty-four. Neither body was ever found. 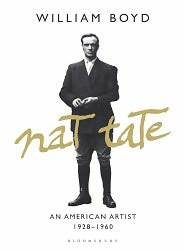 This small book memorializing Nat Tate is William Boyd’s homage to this forgotten artist. Looking very much like a fine art monograph about Nat Tate, the book boasts thick semi-gloss paper, wide margins, understated design, a great deal of white space, and many photographs of Nat Tate from childhood to his death, and his friends, family, and associates. At a party to celebrate the publication of this memorial to Tate on April 1, 1998, several hundred artists, dealers, writers, and the glitterati of the New York art world gathered to hear publisher David Bowie read passages from the book. Another party was scheduled for the book’s London release a week later. Then word leaked out: Nat Tate never existed. The book was a fiction created by Boyd, David Bowie, Gore Vidal, Picasso’s biographer John Richardson, and David Lister, a journalist from the Independent in London. Lister could not wait to post his scoop, jumped the gun, and the whole plan unraveled. At the time, he explains, “I was on the editorial board of an art magazine called Modern Painters, as was David Bowie, which is how we met. With the editor’s cooperation, I came up with the idea of creating an imaginary painter. However, his life would be tricked out with absolute authenticity: photographs, reminiscences, examples of surviving artwork.” They didn’t, apparently, figure on the importance of a journalist’s need for a scoop, and the plan fizzled. 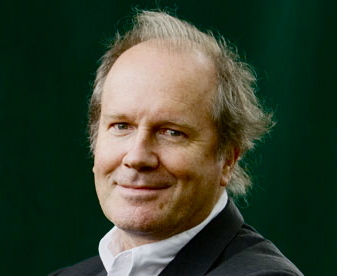 Since the original publication in 1998, Boyd says, “The phenomenon has never stopped. There have been three TV documentaries about Tate. The biography has been translated into French and German and will be republished in the U.K. and the U.S. this month (May, 2011). In the 2010 TV dramatization of my novel Any Human Heart, Tate is played by the actor Theo Cross. 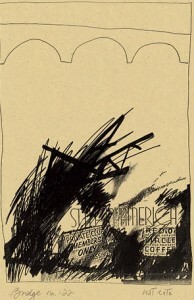 And, even more bizarrely, the first authenticated Tate drawing to go on the open market is about to be auctioned in London.” Since Boyd himself always wanted to be an artist and has a collection of his own work in his own house, we can only hope that he feels happy with the Nat Tate work that will be sold. This is a fascinating turn of events, and I confess that as I was reading this book, knowing in advance that Nat Tate never existed, I really found myself wishing he had existed. I wanted him to be a posthumous success. I could think of many wonderful artists, people I know and love, whose work is every bit as good as that of much more famous artists, but who never made the publicity connection, or the connection to the right New York gallery, or who were not able to “play the game” to be famous and successful. It is for those people that I wanted Nat Tate to be remembered. Perhaps he will take on a new life. 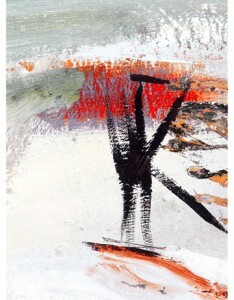 “Unnumbered Bridge,” by Nat Tate is from http://www.harpersbazaar.com I have found this drawing haunting. If you squint at the bottom center of the picture (to the left of the white sticker), you will see a man’s face. 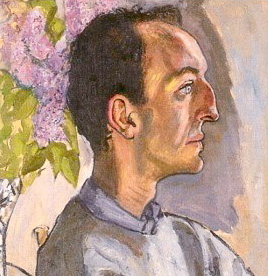 The artist might have used this photo of Tate from the cover of the book as his inspiration.